A correctly calibrated monitor is an essential tool for producing accurate prints. Your monitor should be calibrated to a standard neutral point to become part of an open loop colour system, which is the open standard across the photographic and imaging industry. 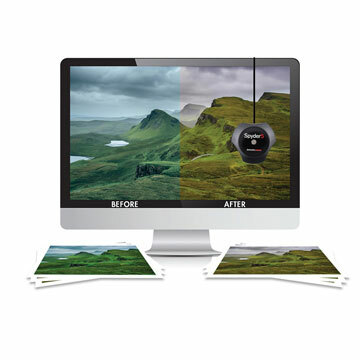 This means that it can show you how your images will look when printed or viewed on other monitors. When preparing digital images for print the quality of your monitor, it’s proper calibration (using a hardware calibration device) and the lighting of your workspace and print viewing areas are the most important steps to get right if you wish to achieve predictable and consistent results. You cannot calibrate a monitor accurately enough by eye alone. A hardware monitor calibration device will insure accurate and consistent monitor calibration. We recommend the Spyder 5 Pro. When using a colorimeter the software will usually have a basic and an advanced mode. Because you will be producing a calibration that is unique to your monitor/viewing/printing conditions you will need to use the advanced mode. Most monitors have a brightness in excess of any print media and will need calibrating. If you don’t, your prints will always look too dark when compared to the image on screen. The aim is to calibrate the monitor so that it mimics the characteristics of the printed page. Different papers can have different base whites (which effects overall colour balance), so you will need to calibrate your monitors white point to match the paper you are intending to print on. In other words a monitor that hasn’t been calibrated won’t match any media and one that is calibrated to be a good match for an image printed on Fuji Crystal Archive won’t be a good match to an image printed on Hahnemuhle Photo Rag Bright White as their base whites are very different. The standard recommended aim values are white point 6500K and brightness of 120CD. The best way to confirm that your monitor is successfully calibrated for printing is to have a test print made which includes an area of white so that you can judge your white balance and luminance correctly.